The Red Rose Classic is fun for the entire family. The Red Rose Classic is a premier Dog Show held at one of the finest indoor-outdoor facilities in the east. LKC has conducted AKC sanctioned shows each year for over 60 years. The site of our show is the Lebanon Valley Exposition Center in Lebanon, Pennsylvania. Located on 85 acres the show site is just five miles from the Pennsylvania Turnpike and about 20 miles from Harrisburg International Airport. There are over five acres of hard surface parking for large vehicles and trucks. The Red Rose Classic is a must-attend for the whole family and there's something for everyone. Don't miss this exciting event! The Lancaster Kennel Club Dog Show is one of the best entertainment values around. For only $5.00, you can spend an entire day admiring thousands of beautiful dogs, shopping the vendor booths and enjoying such events as Obedience, Rally and Confirmation. Everything you want to know about buying, training and caring for your dog is presented under one roof. You can also talk face-to-face with experts on any dog related topic and learn about more than 80 different breeds. Many of the top-winning show dogs in the country representing every breed recognized by the American Kennel Club will attend the Lancaster Kennel Club Dog Show. Here's your chance to see rare breeds and extraordinarily well-trained performance dogs. 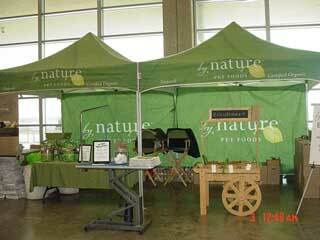 New in 2010 - by Nature - certified organic pet foods.